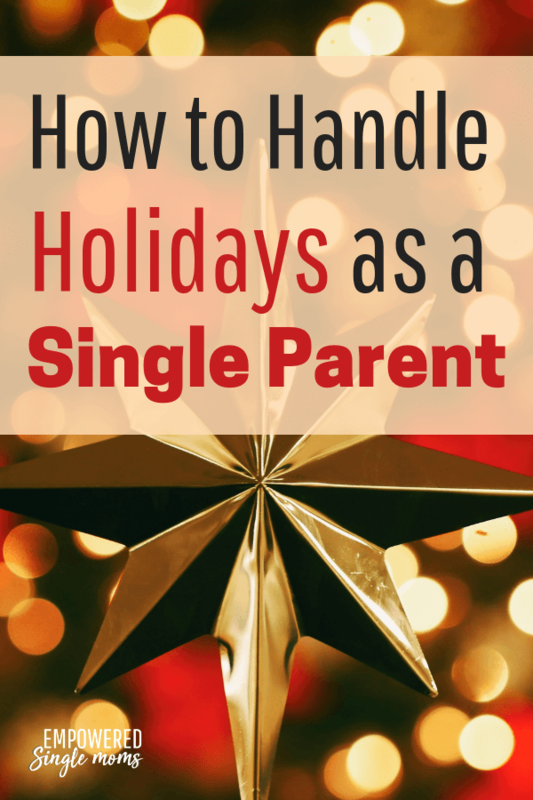 Are you dreading your first single parent holiday season? Most of us do. I remember my first Christmas as a single mom. I felt like a complete and utter failure with a truckload of guilt. Growing up family Christmases were a four generation affair. My wonderful grandmother always brought her special scalloped potatoes. I later learned the secret ingredient was more cream than I would have ever dreamed of adding. She read the Christmas story from the gospel of Luke before we opened presents. My aunt Sharon brought an amazing tray of homemade candy and cookies. We didn’t make homemade candy at my house growing up so I looked forward to it every year. We had special appetizers and tons of side dishes. It was a lot of work, but each family contributed something to make the feast special. In contrast my first Christmas as a single mom there were only the 3 of us. We had stopped having Christmas with extended family due to my husband’s work. He never had enough time off at Christmas for us to travel. In the meantime, the cousins and my siblings had grown up to start families of their own and my parents had become snowbirds often traveling to a warmer place for the winter. So Christmas wouldn’t have been the same even if I had been able to travel. Their dad and I decided to share Christmas holidays, so the kids could spend time with both of us at Christmas. This made it impossible to travel at Christmas. Money was tight and there was no other adult to help make the day special. As moms, we grieve the dream of a happy two-parent family and few times are more about family than Christmas. The old rules and patterns no longer apply. 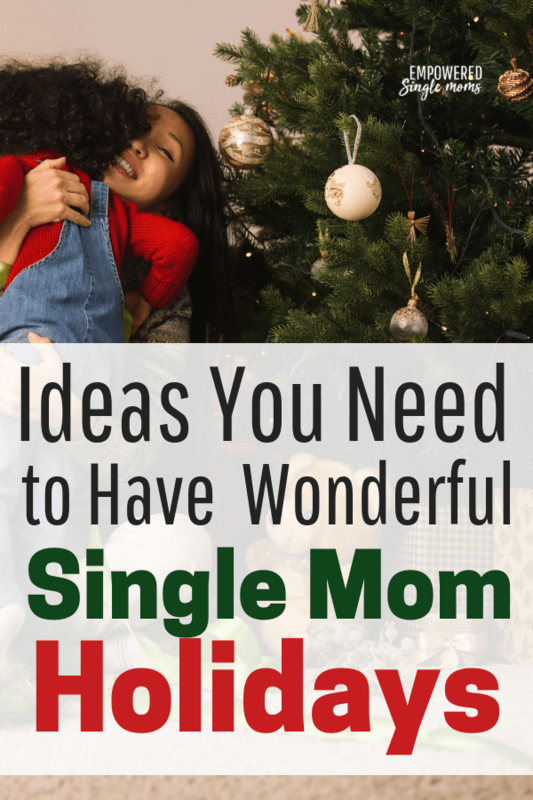 Holidays are some of the hardest times for a single parent, but with flexibility and creativity, you CAN do this. First, realize that if you attempt to replicate what you had in the past it might work, but it might also be sad for everyone. Instead, think about what you used to do for holidays and evaluate what you can and want to keep, what you want to remake, and what you want to stop doing. Then think about what you want to add. Attitude is everything around the holidays, so keep yours positive. Decide both how and when to celebrate with your children. What will you do if you will be by yourself for the holidays? Don’t neglect to make the holiday you spend by yourself special and fun too. If your extended family is close enough to get together and your work schedule permits it, by all means, get together. When you have the kids on the days your family celebrates, this will not be too disruptive. If you do not have the kids on the day your family usually celebrates, check if it is possible to adjust the date and celebrate early or late. I know a couple of single moms whose exes had the kids for the bulk of Christmas vacation because the dads lived far away. One mom started a tradition of celebrating Christmas on New Year’s Eve. The other would celebrate Christmas early before the kids left to see their dad. Sometimes distance, work schedule, or parenting schedule limits your ability to spend holidays with extended family. If you will not be with extended family on the holiday, can you connect virtually with Skype, FaceTime, or even old-fashioned phone calls? Decide what you are going to do to make the holiday special. You could try to do the traditional meal, but it may be exhausting if you are the only adult making all of the holiday preparations. An alternative is to come up with a delicious and easy meal that will allow you to relax and enjoy the holiday. Some fun meal ideas are a Christmas-tree-shaped pizza or an array of appetizers. Are there friends you can share the holiday with? Invite them over! The point of the holidays is to enjoy the time together. You are making memories. You may not be able to replicate the memories you have of holidays growing up, but you can make your own good memories with your children. Make an art project, play family football, take a holiday hike, or spend time playing games or putting a puzzle together. Many families make volunteering part of their holiday tradition. You can include your children in the planning. Experiences make the best memories and there are a lot of experiences that cost little money. 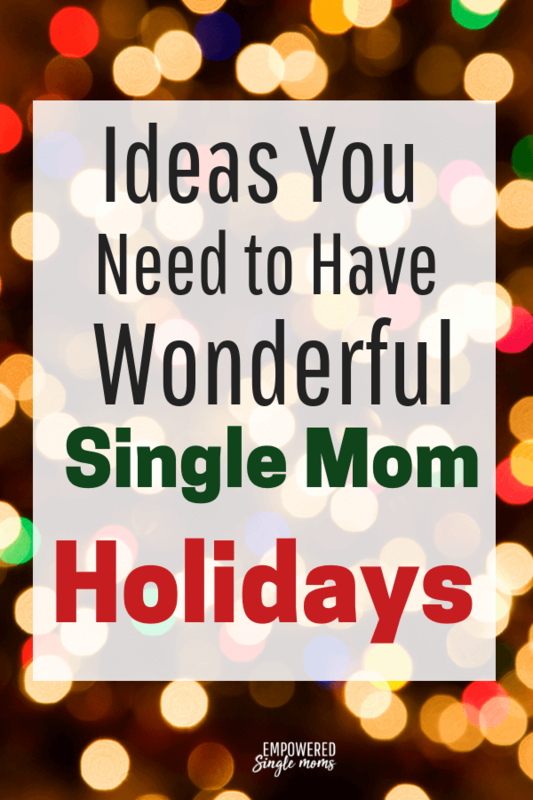 Related: Do You Know How to Have a Fun and Cheap Single Parent Christmas? Sometimes work schedules, parenting schedules, and distance work together so that you are alone on a holiday. That can be sad, but if you are a single parent and your co-parent lives far away you may have a little downtime. When you are raising children, it is a rare luxury to have a day or longer to do whatever you want to do. Try to cherish the time you have to not be responsible for someone else but yourself. Plan how you will maximize this time alone. Is there a project you have been wanting to get done? This may be the perfect time to paint a room or redo a piece of furniture. You could play tourist where you live or take a day trip to a neighboring town. Can the children take some time to virtually connect? Coordinate with the other parent to find out what will work for their holiday schedule. Several single parents have said one of the saddest things about Christmas after their divorce was that no one got them a special gift. Perhaps their parents gave them money, but they no longer exchanged gifts with siblings or friends. If you know a single parent, a nice thing to do is to put together a small care package. This will be especially appreciated if it is their first Christmas after the separation. Care package ideas include: really nice bubble bath, a fancy soap (the kind you admire, but never buy yourself), a fun kitchen gadget, fancy hot chocolate, and a bottle of wine. If your schedule allows and the dynamics would work, you could invite them to spend some time with you and your family. The most important part of the holidays after a divorce is to keep a positive attitude. Focus on what you can do and what you are grateful for, not what is missing. Oh, and as for feeling like a failure with a ton of guilt, we came to really cherish our small family Christmases. We made new traditions that we cherish. We focus on spending time together making memories and relaxing. I have come to feel a little sorry for my friends who spend most of Christmas vacation packing and rushing from one place to another. Then they end their Christmas vacation exhausted with heaps of laundry to do. We end ours cherishing time together and having connected with long-distance family via phone. There is a very special sweetness in that. I made a private Facebook group, Empowered Single Mom Tribe, join here. We would love to have you it is a place to share your single mom struggles, give and receive encouragement from other single moms.